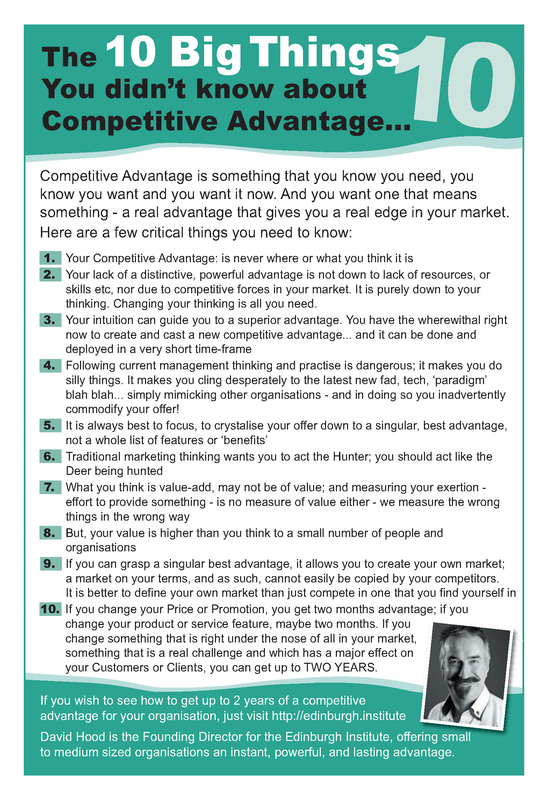 Forget what you ever thought you knew about Competitive Advantage! Here at the Edinburgh Institute, we ignore the latest fad, the chattering classes ‘next best thing’ and do something radical for you – we get you to actually think for yourself. Its your business, your products and services, your customers, your staff, your why, what and how you do what you do. Therefore, we assert that copying, emulating what other organisations tell you that ‘you must do’ etc is no longer sufficient for you to compete; we gear you up so that you can think for yourself – your own needs, your own challenges, your own competitive and compelling advantage….. Your own EDGE. And by thinking differently, not like your competitors, working on your OWN organisation and its place in the market, you create your own market too! Is that not worthwhile? Is that worth taking a few days out and working with us? ‘Mediocristan’ is not a country where we live. Your organisation has to be better, more than just different, to survive and thrive. That is why we are here. For you.